The upcoming Android One phone from Xiaomi, the Xaiomi Mi A2 is all set for the launch in India on Aug 8th 2018. The Xiaomi Mi A2 received NCC, GeekBench, EEC Certifications last month. 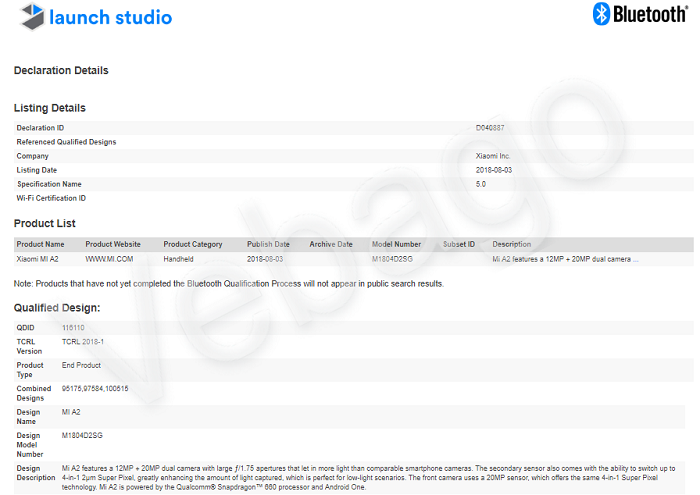 Now, the Xiaomi Mi A2 Certified On Bluetooth SIG certification with the model number M1804D2SG, ahead of India launch on Aug 8th 2018. The complete details of the certification can be obtained from the image below. Let’s now have a look at its features and specifications. The Xiaomi Mi A2’s Bluetooth SIG listing on the Launch Studio website doesn’t reveal anything new about the handset. There is a front camera with a 20MP AI sensor with Soft-LED flash that captures beautiful selfies. The Mi A2 features a 12MP + 20MP dual rear camera with large ƒ/1.75 apertures along with an LED flash, which helps in capturing the perfect images even in low-light conditions. The Xiaomi Mi A2 is powered by the Qualcomm Snapdragon 660 octa-core processor and runs on Android One. The device comes with a 3GB/4GB/6GB of RAM and 32GB/64GB/128GB storage options, which can be further expanded up to 256GB using a microSD card. The smartphone also supports Face Unlock. The phone features a 5.99-inch screen with FHD+ 2160×1080 pixels resolution, 18:9 aspect ratio, and 2.5D curved Gorilla Glass for protection. Connectivity options on the Mi A2 include Bluetooth 5.0, USB Type-C port, 4G LTE, Wi-Fi a/b/g/n/ac, and an IR controller. The Mi A2 is powered by a 3010mAh battery with Quick Charge 4.0.